The purpose of the fold-down rear seatbacks is to allow you to carry longer objects that could not be accommodated in the cargo area. Never allow passengers sit on top of the folded down seatback while the vehicle is moving. This is not a proper seating position and no seat belts are available for use. This could result in serious injury or death in case of an accident or sudden stop. Objects carried on the folded down seatback should not extend higher than the top of the front seatbacks. Doing this could allow cargo to slide forward and cause injury or damage during sudden stops. 2.Lower the rear headrests to the lowest position. 3. Pull on the seatback folding lever located in the trunk. 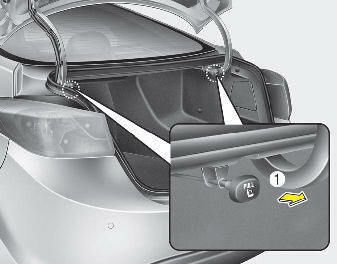 4.Fold the seatback toward the front of the vehicle. 5. 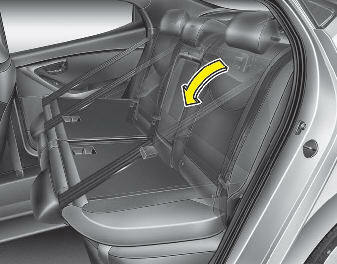 To use the rear seat, lift and pull the seatback rearward. Pull the seatback firmly until it clicks into place. Make sure the seatback is locked in place. When you return the seatback to its upright position, always be sure it has locked into position by pushing on the top of the seatback. When folding the rear seatback, insert the buckle in the pocket between the rear seatback and cushion. Doing so can prevent the buckle from being damaged by the rear seatback. Routing the seat belt webbing through the rear seat belt guides will help keep the seat belts from being trapped behind or under the seats. Cargo should always be secured to prevent it from being thrown about the vehicle in a collision and causing injury to the vehicle occupants. Do not place objects in the rear seats, since they cannot be properly secured and may hit the front seat occupants in a collision. Make sure the engine is off, the automatic transaxle is in P (Park) or the manual transaxle is in R (Reverse) or 1st, and the parking brake is securely applied whenever loading or unloading cargo. Failure to take these steps may allow the vehicle to move if the shift lever is inadvertently moved to another position.